The holidays are over and now you have had your fill of all things rich and/or sweet. It's crazy cold out there, you are back into the swing of things with kids at school, and need something that can be rustled up in a hurry. This soup is just the thing. Just toss everything in the slow cooker, go do your thing, and come home to delicious soup simmering away, all ready to go! I make a pot, then take it to work with some crackers and cheese. 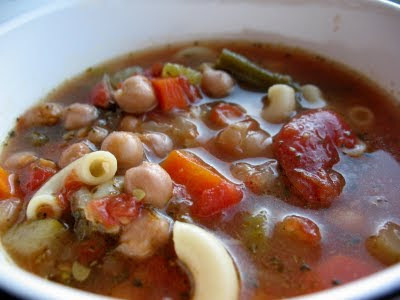 I'm not even a veggie soup fan but the pesto added at the end makes this extra delicious. You could even add a bit of crumbled bacon if you wanted, which might add some great flavor! If you prefer the veggies in your soup to be tender crisp, don't cook it as long. These ones cook up really soft and tender. Cooking the pasta separately and adding it when you want to eat will keep it from going mushy. Turn the slowcooker to high and add about 2 tsp of oil. Stir in the onion, garlic, celery, and carrot, cover and allow to cook while you assemble the other ingredients. 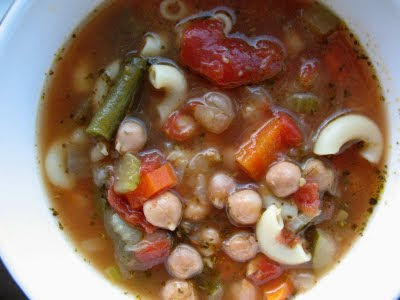 Stir in the green beans, bay leaf, chic peas, tomatoes, zucchini, and chicken stock. Cover and allow to simmer on low for 6-7 hours. Cook the macaroni according to package directions, on your stove top. Drain. Add the macaroni and pesto to the soup just before serving.